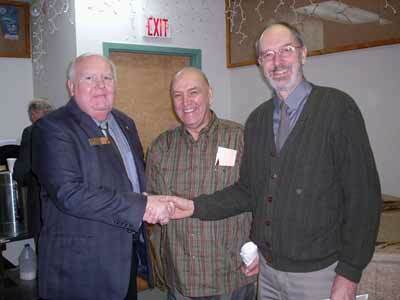 During the Feb. 18, 2008 meeting, President Richard Burpee welcomed two new members into the Club. Pictured above are President Richard, left, and Frank Cormier and Dr. Barry Beckett. On Jan. 15, 2009 the Rendezvous 2008 organizing team met at the Mediterranean restaurant to wrap-up and share some laughs and successes for the rendezvous 2008 gathering. Pictured (L-R): Ralph Wood, Bill Bydges, Wes Cosman, David Fraser, Carl Tompkins, Fred Shillington, Laurie Hossack, President Richard Burpee, Mildred Brydges, Betty Thomkins, Robert Taylor. The empty Chair is Robert Lockhart, who was behind the camera. The gathering was spearheaded by Co-chair Bill Brydges, and it was with great pride that he, Fred Shillington and President Richard Burpee advised that all was a success, both financially and socially. "The memories will last a long time but its time for our club to say thank you. To all the committee chairs and members who gave so willingly of their time for more than 24 meetings over the course of two years for "Cheap Coffee", Bill and Fred, thank you, sincerely. " At the Dec. 2008 meeting, President Richard Burpee (top photo) was pleased to announce that Brian Mitchell (bottom photo) had accepted the position of Vice President and Program Director for our Probus Club. The Club is very fortunate to have Brian step up to this position. We know he will do a great job!! Probus Canada President Art Buck (far left) is very pleased to be presenting the “John R. Morris Founder’s Award” to a long time Probus Member who has definitely made his mark in “outstanding support for the growth and development of Probus across Canada” over the past 15 years as a member. 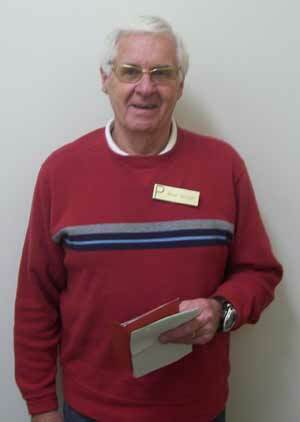 Bill Brydges is a Charter Member and a Past President of the Probus Club of Saint John, N.B. 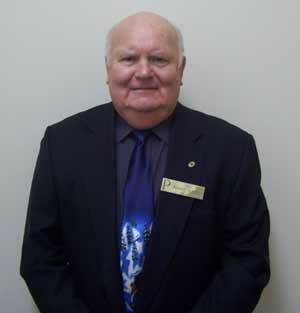 He has also served on the Board of Directors of Probus Centre-Canada, Inc. doing so with dedication and commitment. 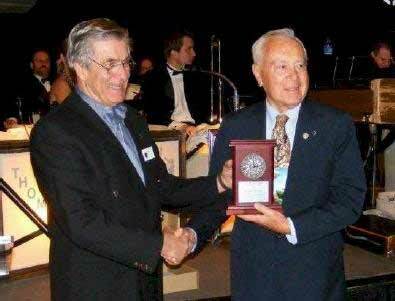 He has also been involved in the development of new Probus Clubs in his area and most recently, without hesitation, successfully served as Co-Chair of the Probus Canada Rendezvous 2008 held in his community. 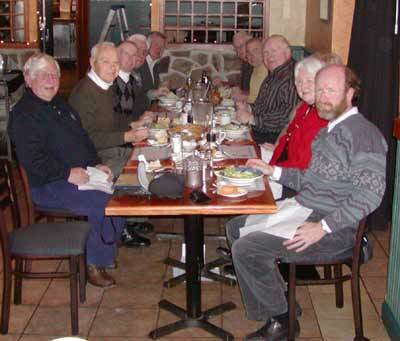 This happy group are Members of the Organizing Committee of the Probus “Rendezvous 2008” held in Saint John, N.B. this past September. Having just received “Certificates of Appreciation” from Probus Canada President Art Buck (3rd from left) they have a right to smile at the success of a tremendous event. Just under 300 attendees took advantage of Saint John hospitality to enjoy three days of fun, fellowship and idea exchange in Canada’s “Loyalist City”. Survey returns are already in and, with few exceptions, they express feelings of great satisfaction and enjoyment with lots of opportunity for business as well as sight seeing and just plain good times. Thank You Saint John !! It's hard to believe that we're at the end of another year--and boy what a year it has been. Our efforts across this Country have brought us to 200 Clubs, …. the "long sought after" number and now we can set our sights on a new target … perhaps 250. My thanks to all who helped to make this growth happen and may it continue ! And “Rendezvous 2008---Catch the Wave”---held in Saint John N.B. in late September, which turned out to be a "super" success. The ---food--- fellowship--- entertainment---tours---and not to forget the discussions & the comments from the workshops---left us with much pride about the benefits of belonging to such a great group called “PROBUS”. I personally met so many from across Canada who commented on their pleasure at being involved with our organization. Our Board will be discussing many of the recommendations brought up during the workshops, particularly those dealing with improved communications, and sharing more information between Clubs. A very sincere “Congratulations” to the Saint John Clubs , their non Club volunteers---and to all our members who were there to enjoy their efforts. Dave Lester, President 2005 - 06, shares a laugh as incoming President David Frase presents him with his past president' pin on Sept. 20, 2006. 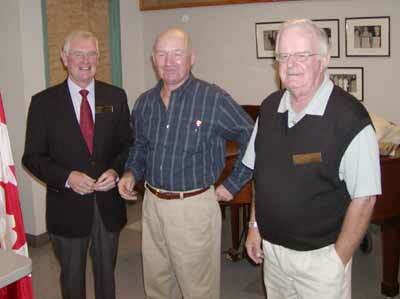 One of President Dave's last chores was to induct new member Frank Setchell (center) to Probus. Frank was sponsored by Fred Shillington (left). 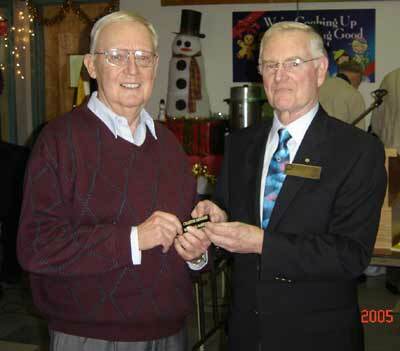 At our Christmas luncheon on Dec. 14, 2005, President David recognized our Charter Members with special name badges. Pictured above are the initial four Rotarians who did the ground work to invite 44 gentlemen to a meeting to discuss the creation of a Probus Club. 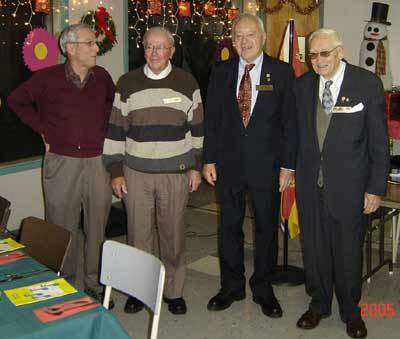 Pictured above are Gordon White, Gerald Barnett, Bill Brydges, and Canon Lloyd Lake. Of the 44, 43 signed as Charter members. 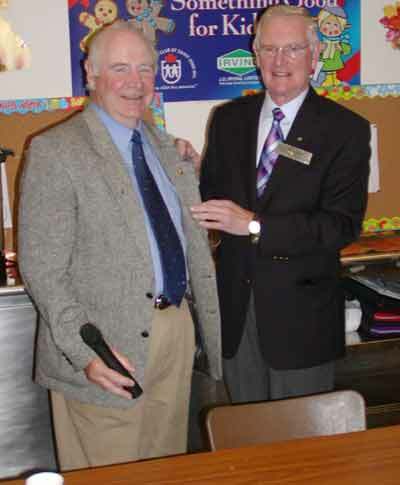 Pictured above is President David presenting founding President William Bartlett with his new Charter Member's name badge. The following Charter Members who were in attendance to receive their new badges: Left to right back row: Bill Bartlett, Reg MacKenzie, Alex Penman, Robert Crawford, Blake McCullogh, Gordon White, George Teed, Robert Reeves, Canon Lloyd Lake, Gerald Barnett, Bill Brydges, and Mac Pike. In front are John Cook, Duane Lister. 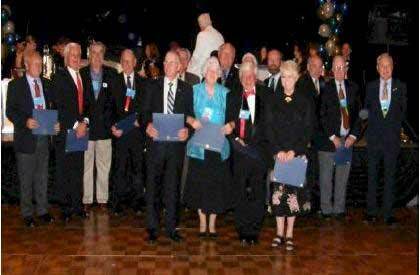 Missing from the photo were: Ross Coates, Horace Hall, Jack Myles, Frank Ervin, Harry Hoar, Glen Scott, David Filliter, Eric Josselyn, Ed Graham, and Bob McConnell. 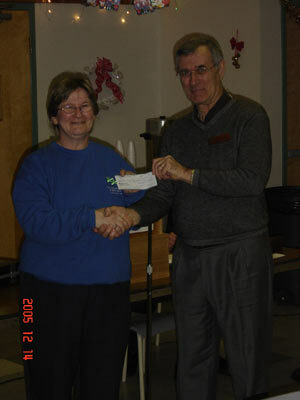 During our luncheon, Treasurer Ed creaser presented Debbie, Cooper, the Boy's and Girl's Club Executive Director, with a cheque for $500.00 for Probus' Christmas Donation. During the meeting, the members present were entertained by Saint John Quartet members: Sonja Adams, David Adams, Ericka Low and Chris Buckley. 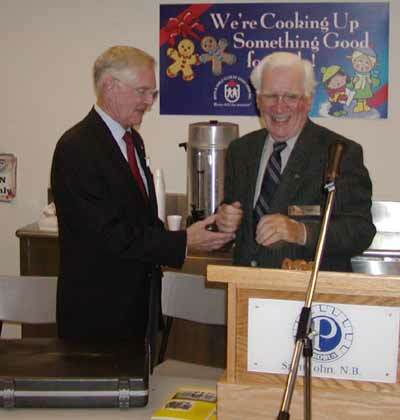 On the Sept. 21, 2005 meeting of Probus at the Boys' and Girls' Club of Saint John, the new executive for the new Probus year were voted into office. Pictured here is incoming President David Lester presenting out going President George McCaughey with his past president's pen. At each meeting, time is set aside for a guest speaker. As you will see from the list below, our Club has been very fortunate to have excellent speakers each month. As a memento for speaking, the Club photographer presents the speaker with a photo of his talk. Some photos of our speakers may be seen here. Fellowship and laughter is a big part of each meeting. Here are a few pictures of the weekly meetings for your preview. A highlight of each year is when the Club membership make a field trip to a location of interest. It may be to the Atlantic Salmon Federation, Irving Oil Refinery, the Hillsborough Train Tour, or some visit yet to come. Please have a look at the field trips.